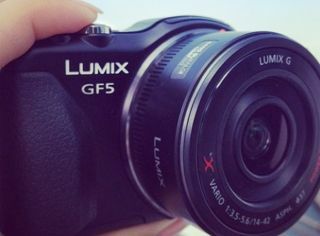 The first picture of the Panasonic Lumix GF5 has been revealed, ironically, on iOS photo sharing site Instagram. A snap of the purported successor to the highly-rated Lumix GF3 compact camera system was uploaded by a Hong Kong celebrity who goes by the name of Angelface. Angelface is also a brand ambassador for Panasonic. Is that enough to convince you that this micro four thirds snapper is the real deal? Judging by the hand gripping the photo, Angelface either has Andre The Giant-sized paws or the GF5 is going to be a little smaller than the GF3, which had already been shrunk to a more compact-like size. If you're wondering why Panasonic might have skipped the GF4 naming convention and opted to go from GF3 to GF5, well SlashGear points out that the word "four" sounds a little like the word "death" in both Chinese and Japanese (Panasonic is based in Japan) and has thus been avoided. Nothing official from Panasonic on this front yet, but it seems an announcement might be imminent.